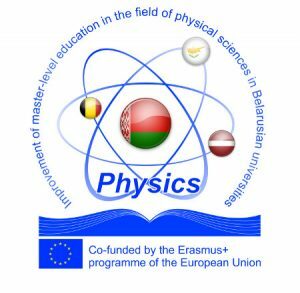 Project «Physics» aims to reform applied physics disciplines nanotechnology, nanomaterials and photonics training programs to promote the emergence of innovation and economic growth in Belarus. Academic institutions and industrial partners’ cooperation will result in creation of new muster level study programs, training courses and appropriate teaching materials. The project will set up a virtual platform, where all partners will have access to training materials, virtual lectures and electronic library. 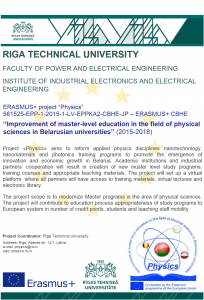 The project scope is to modernize academic programs in the topic of energy efficiency, the project will contribute to education process in such aspects of this topics energy saving like enhancement of energy efficiency, use of renewable sources. Budget: The project total budget: EU Grant 660 576 euro, co-financing 67 270 euro. The scientific manager of the project: Dr. sc. ing. Nadezda Kunicina is a senior researcher and professor of Riga Technical University, the Institute of Industrial Electronics and Electrical Engineering, Faculty of Power and Electrical Engineering. Nadezda Kunicina is the main author of the idea of this project. 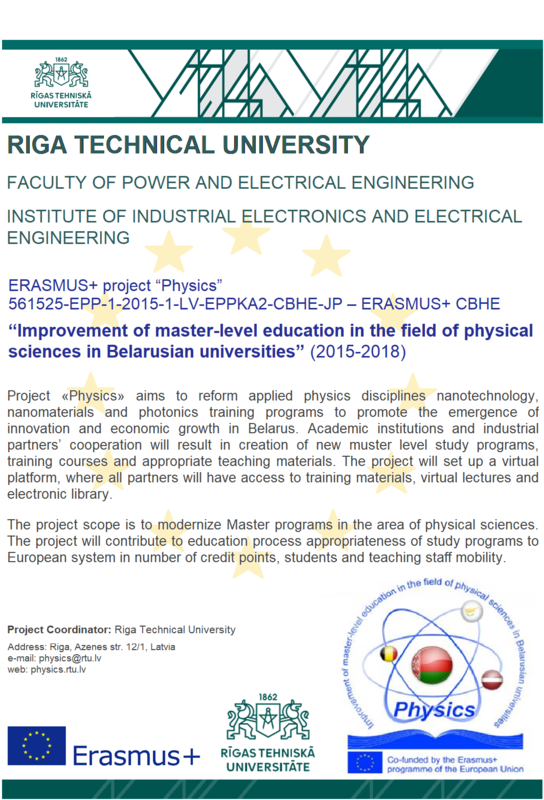 The project manager: Dr.sc.ing Anatolijs Zabasta is a senior researcher and a project manager of Riga Technical University, the Institute of Industrial Electronics and Electrical Engineering, Faculty of Power and Electrical Engineering. The acting scientific project manager, a responsible person for the main project deliverables: Dr.sc.ing. 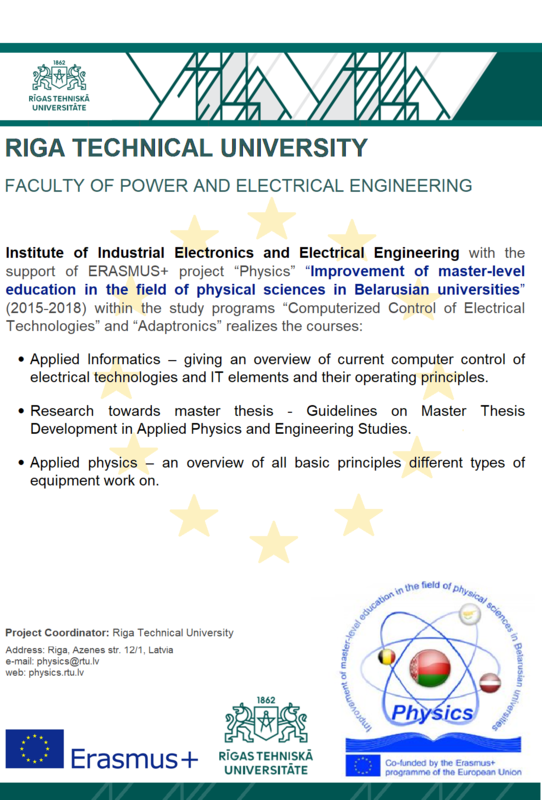 Anastasija Ziravecka, is a senior researcher and professor of Riga Technical University, the Institute of Industrial Electronics and Electrical Engineering, Faculty of Power and Electrical Engineering. The information specialist: Mg.sc.ing. 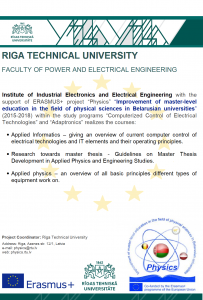 Alina Galkina is a researcher of Riga Technical University, the Institute of Industrial Electronics and Electrical Engineering, Faculty of Power and Electrical Engineering.